I tried making a path to the back yard to test it out. Our second class was about turf removal and landscape design. Depending on if you have cool season lawns or a warm season lawn, turf removal can be easy or with warm season, more difficult. I’m not going to talk about warm season here because I am already writing too much. 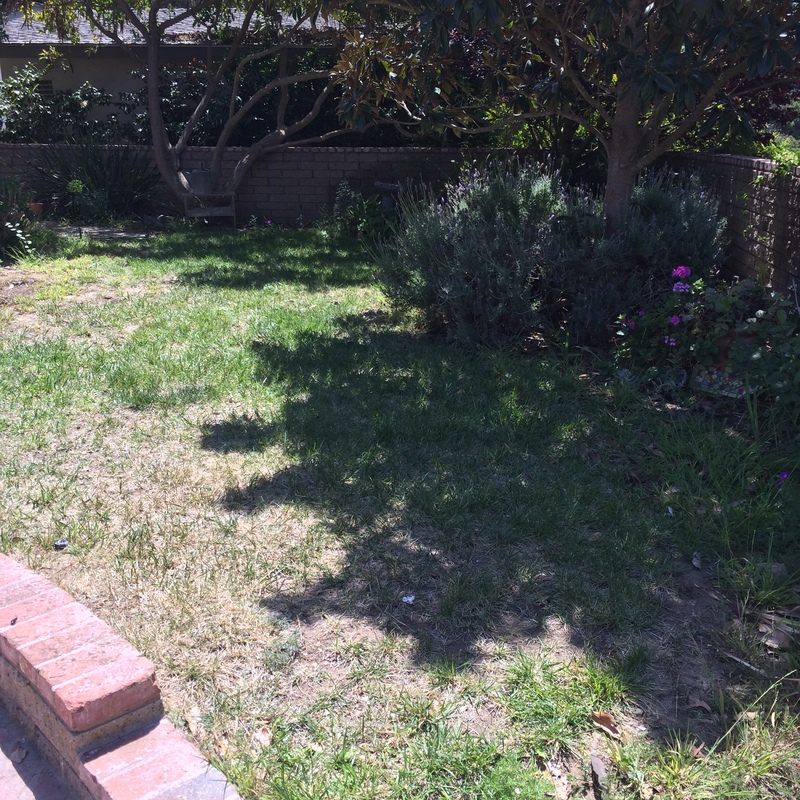 Fortunately, I have a cool season lawn (which pretty much means it is green year round). The great news is that you don’t have to dig it out like I did. You can basically smother it with newspaper and cardboard and mulch to kill it. If you don’t want to wait until it is entirely dead (which takes 3 to five months or even 6 to 8 weeks) you can dig holes through this smothering layering and plant new plants in the soil below. For people on deadline with water rebates, this is a tremendous help. Here’s the formula for sheet mulching: First cut out three inches of turf along the edges or hardscape. Then right on top of your old grass, overlap newspaper or cardboard by 6 to 8 inches. Water. Add 1-2 inches of compost; water, then add a top of 3-5 inches of soil building mulch (brushy mulch); pull compost and mulch away from leftover plants and tree trunks. Don’t plant in the mulch. Dig through and cut holes in the cardboard to get to dirt (if you must plant). Otherwise, let this bake and decompose and you will have great soil for your new garden. 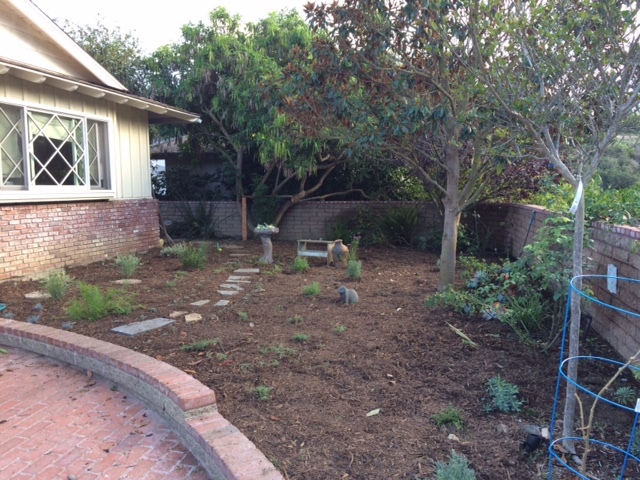 The process of layering actually improves your soil as the mulch, newspaper and old grass decompose and re-enter the “soil food web” our fearless teacher/landscape designer Sharon Lowe told us about. If you can enhance this process and enrich the soil, you won’t need to use fertilizer because the plants will find the food they need in the soil. She calls it the “chocolate cake” recipe for soil improvement. I found this one of the most interesting topics of the class. Next we talked about plants–ooo goody, plants. We learned about balance, color, contrast and unity in our choices. This is something I’ve learned from hiring a plant designer previously and I have tried to implement these good practices over the years. The problem is sometimes plants die and then I go nuts trying to find the right thing to grow. I think, “I will plant one, and if it grows them I will know to get four more or two more, so I have a pattern of three or five plants, etc.” But you forget what your plans were and something will live or die and you find another pretty thing to add in. So I’m a big like a bird collecting shiny objects…. Oh well, not doing that this time. Next class, I have to turn in a map of the front yard and a bubble plan with use areas and plantings. 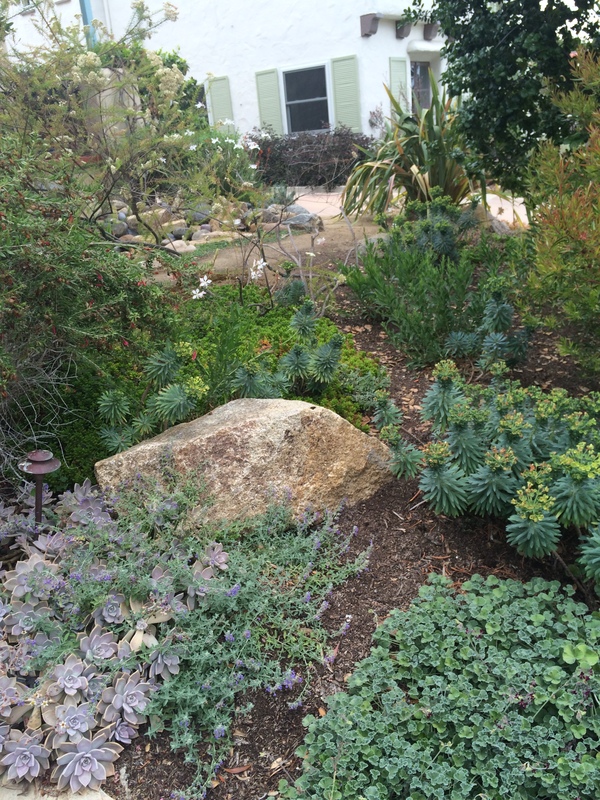 If you want to take it to the next level, you can draw in hardscapes and plants you want. Then you meet with a design coach for 30 minutes to review your plan. They will fill in suggested plants for you and create a legend of plants showing you what goes where. Of course, you can come in with this done already…what do you think I will do? Is it hard to guess…of course, I’m going to draw all the plants! Pretty low-water plants and a rock. I want some big rocks. The one thing that changed from my original idea for the yard is from the advice of my nine year-old. In class, you are taught to really think about how you would use the area and throw out pre-conceived notions of how your yard looks. 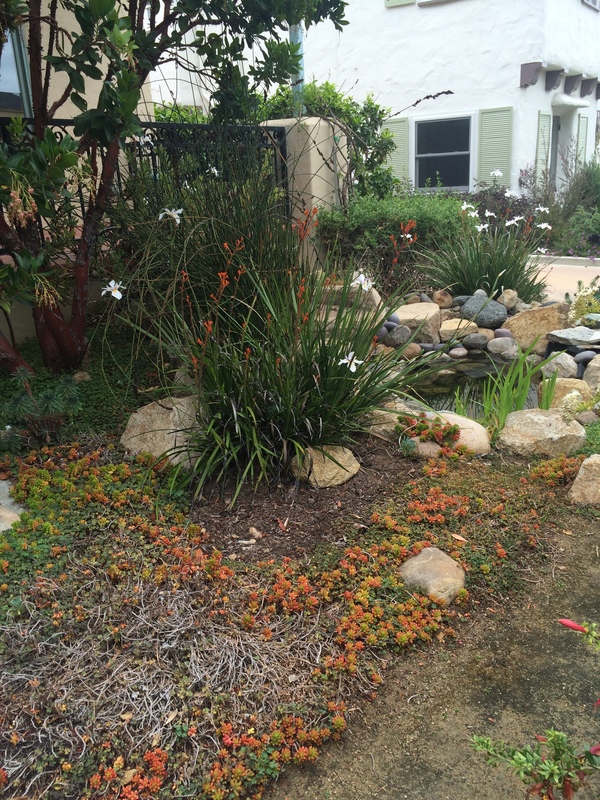 You need to think of the function of the yard and these ideas should influence the form. 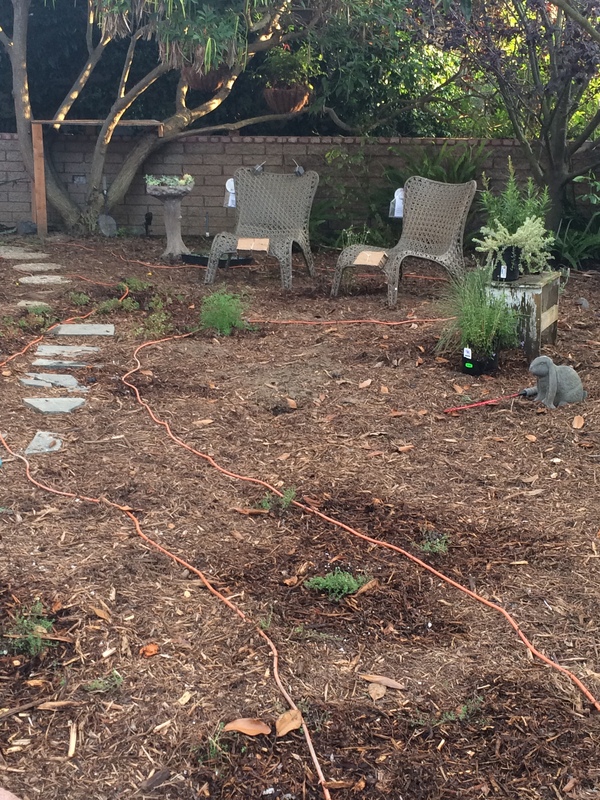 I knew I wanted a path to the back yard (function) and a full cottage-y effect (form), but my daughter, who was unhappy we took our the grass, said, “Where will Cleo (our dog) run in circles when we get home?” She was looking at the mulch-covered yard–and thinking of function. Sample path we made with extension cord. We also might make a flagstone circle or a dg circle where the chairs are. And I thought, she’s right. There is no where for us to throw the dog a ball in the front yard any more, or a place for the kids to play. So we decided to add a “bubble” for kid playing and dog playing. 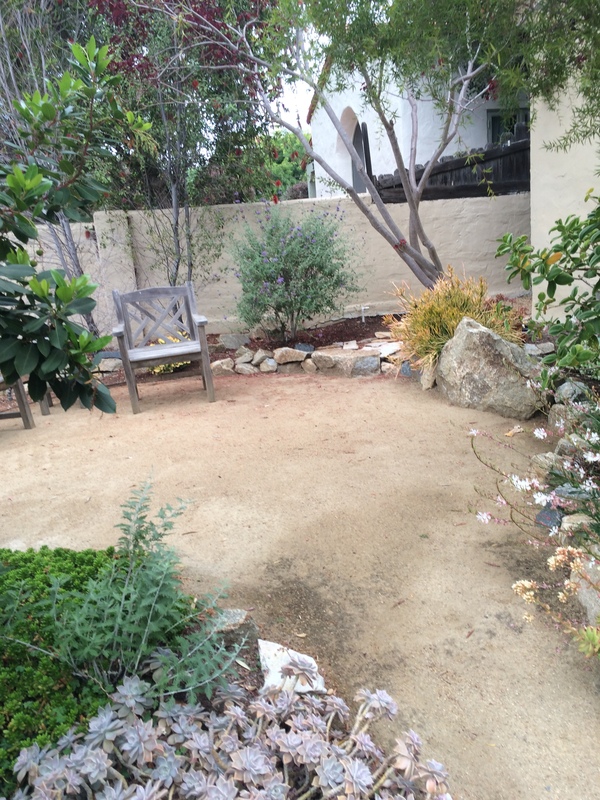 Right now, we plan to make a flagstone circle with some chairs on it but maybe it should be decomposed granite (like in the picture above)–that’s one question I have for the design coach at our meeting. 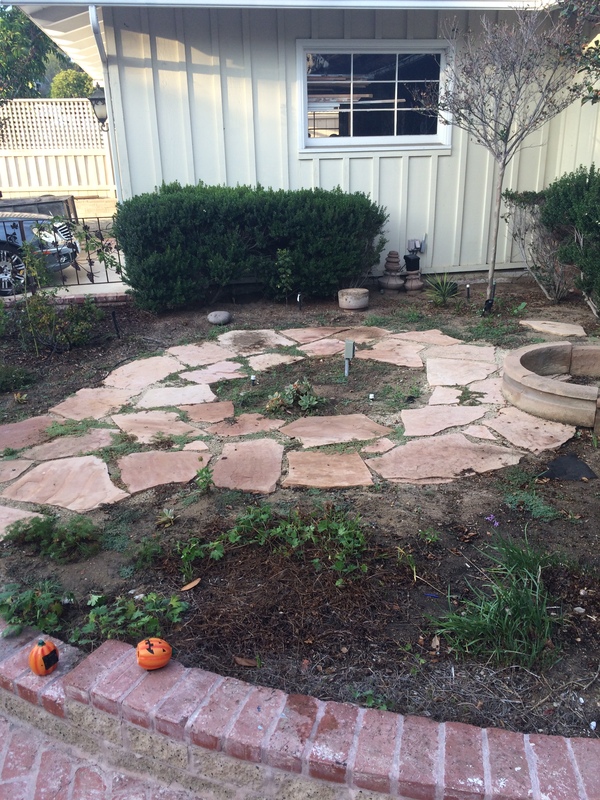 I also want to make sure it won’t be weird to make it too symmetrical with the other side of the yard which has a flagstone circle with a fountain in it (see below). So yes, that’s how we celebrated our anniversary. My husband was a good sport about it and we are well on our way to a new yard.